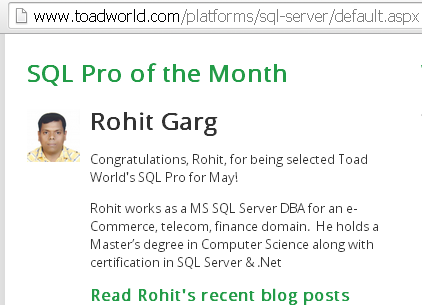 Thanks to Toadworld.com team for recognition ! The concert hall at the Sydney Opera House holds 2,700 people. This blog was viewed about 41,000 times in 2013. If it were a concert at Sydney Opera House, it would take about 15 sold-out performances for that many people to see it. Although, Microsoft release license guidelines for each & every SQL server version. But there are more complex scenarios for licensing then we think. Best person to answer your all queries over licensing is MICROSOFT itself. You can call Microsoft Licensing at 1-800-426-9400, Monday to Friday, 6:00 A.M. to 6:00 P.M. (Pacific Time) to speak directly to a Microsoft licensing specialist. SQL Server Reserve 1 user connection for DAC (Dedicated Administrator Connection)……want to confirm ? January 21, 2013 8:03 pm / 3 Comments on SQL Server Reserve 1 user connection for DAC (Dedicated Administrator Connection)……want to confirm ? Sometime before, I was giving training on basics of SQL Server. One of attendee is having doubt & want to confirm that SQL Server really Reserve 1 user connection for DAC (Dedicated Administrator Connection). So I decide to show a demo for the same. I have changed the no. of User Connections to 1 & then try to login. So below is the PROOF. 2. User Connections New settings. You need to restart SQL Services after this. 3. I Try to Login to SQL Server by SSMS & got Error. But Why ? 4. I Try to Login to SQL Server by SQLCMD & got Error. But Why ? 5. Reason of getting error at step 3 & 4 is DAC (Dedicated Administrator Connection). SQL Server reserve one user connection for DAC. 6. Rollback the changes using DAC & come back to previous settings. You need to restart SQL Services after this.